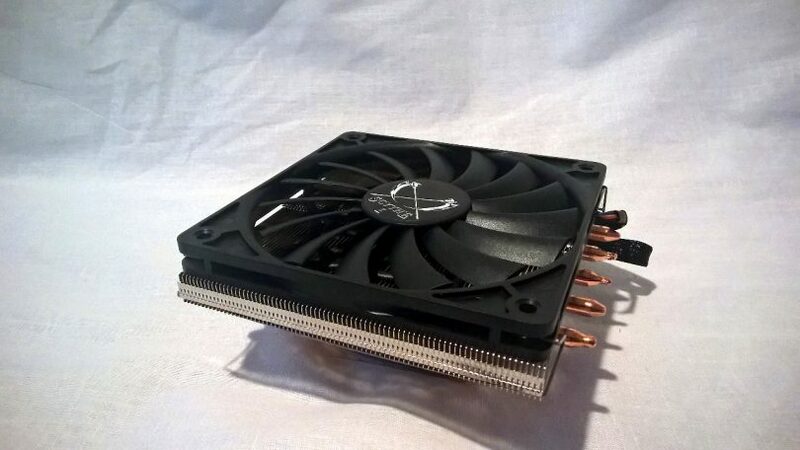 One of the standard CPU cooler options when it comes to building a SFF system is the the Scythe Big Shuriken 2, and this comes as no surprise: the cooler has been around for a while. The low-profile nature of the otherwise generously-sized design means it can fit in a plethora of enclosures that are otherwise height-restrictive above the motherboard, all while providing performance characteristics that are closer to those of large tower-style coolers. 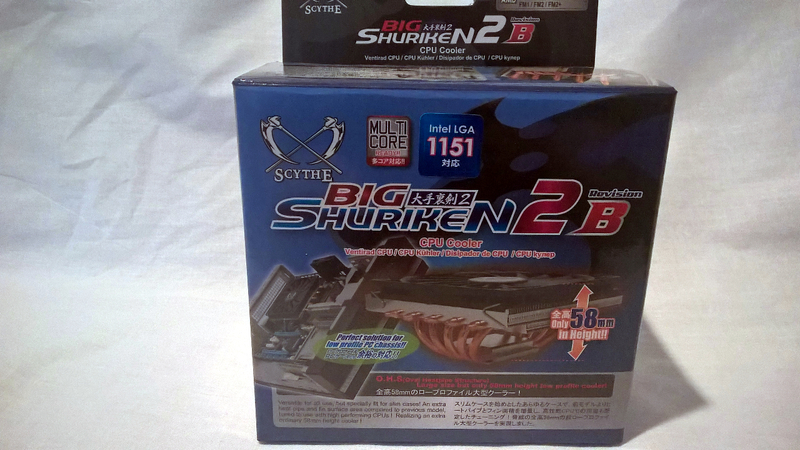 A recent revision of the Big Shuriken 2 – Rev B – added support for LGA2011 and 2011 V3 sockets. As such, we’re taking advantage of this minor refresh to see if the Big Shuriken 2 still holds its own in the SFF CPU cooler battle. Featuring 5 copper heatpipes and a slim 120mm fan, the Big Shuriken 2 is certainly one of the larger SFF orientated coolers on the market – but with its size comes the ability to cope with higher wattage processors. Scythe Co., Ltd., (Registered and incorporated in Tokyo Japan) originally started its business operation in Japan’s famous “Akihabara Electric Town” located in the metropolitan Tokyo, where visitors can find a variety of products from the latest computer parts to the world’s most advanced high-tech electric devices. The cooler has compatibility with AMD sockets AM2, AM2+, AM3, AM3+, FM1, FM2 and FM2+ (as well as some variants of Socket 1207). 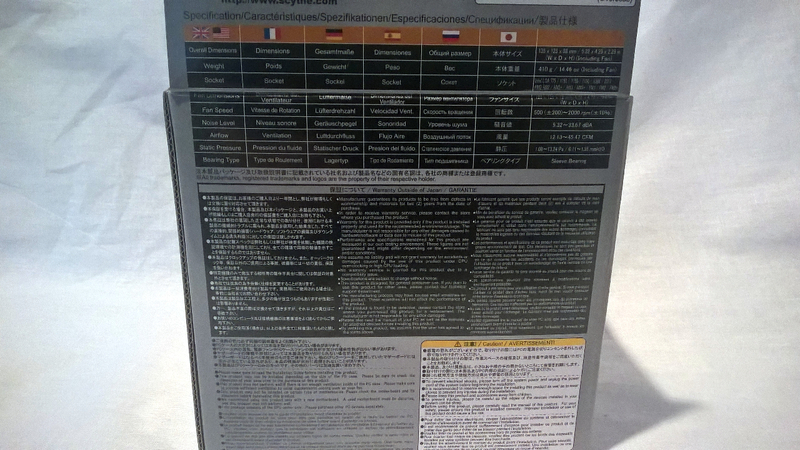 On the Intel side, compatibility is with sockets 1150, 1151, 1155 and 1156, as well as LGA775, LGA2011 and LGA2011 V3. The Scythe Big Shuriken 2 Rev B comes in what can only be described as a “typically-Scythe” styled box (whether or not that’s a good thing, we’ll leave to the personal taste of the user!). 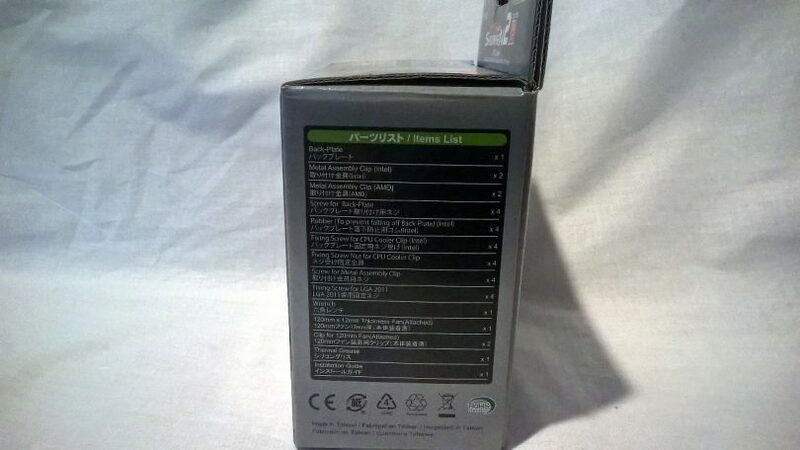 The marketing and specifications are listed in both English and Japanese, a reflection of the company’s Japanese heritage. And the box itself is in full color, and is composed of decent quality cardboard – a welcome fact given the distance these coolers often travel from the factory floor to the home. On one side, we see the fan specifications and a simple graphic illustrating the top-down airflow design. The fan included with this cooler is one of Scythe’s slim (12mm thick!) 120mm fans, which is a major contributor to the reduction in overall height. The rear of the box lists all the specifications of the cooler in 6 languages, as well a few token warnings (sharp edges, read the manual, etc). Hopefully you have a magnifying glass handy! The remaining side shows a packing list, listing all the parts and components included with the cooler. We wish more components included this. 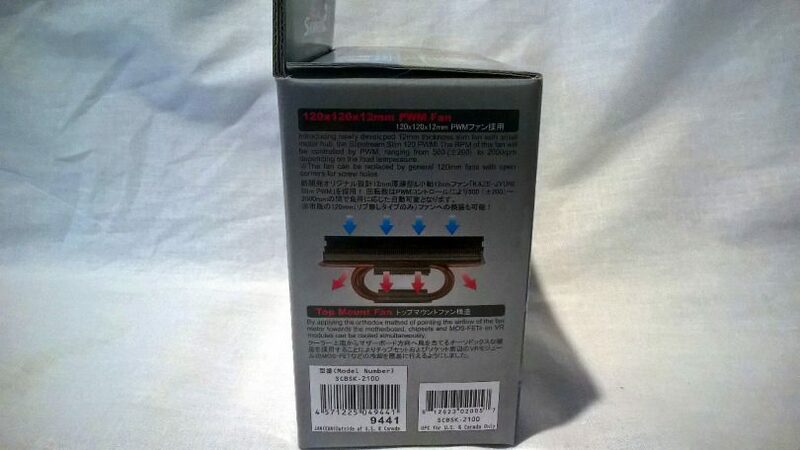 Opening up the box, we immediately begin to look at the Big Shuriken 2 Rev B itself. Perhaps unsurprisingly, the first thing that grabs our attention is the slim fan atop the cooler. This fan is rated to spin between 500 and 2000 RPM, and Scythe claims 9.32 – 33.67 dbA noise output for this fan across that range. That said, I’ve found that it’s not always the loudness of the fan, but the characteristics of the noise it emits, that make a difference. I’ll speak towards this more qualitative measure later on. 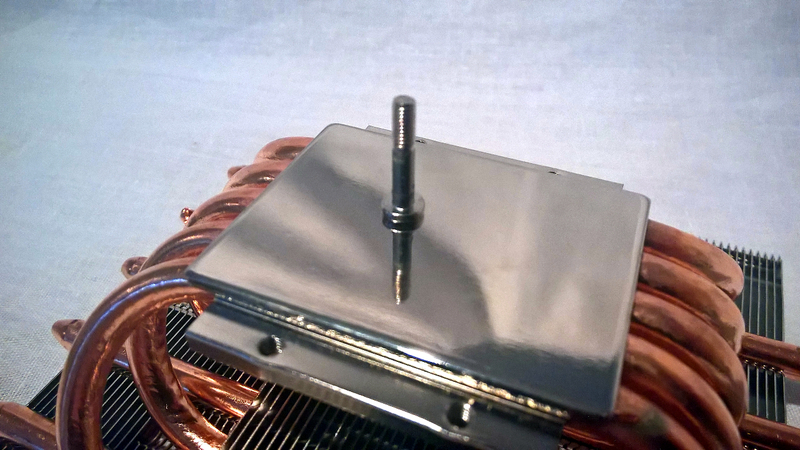 Flipping the cooler over, we see that the base is nickel plated copper. A clean reflection with no discernible distortion is indicative of good quality. 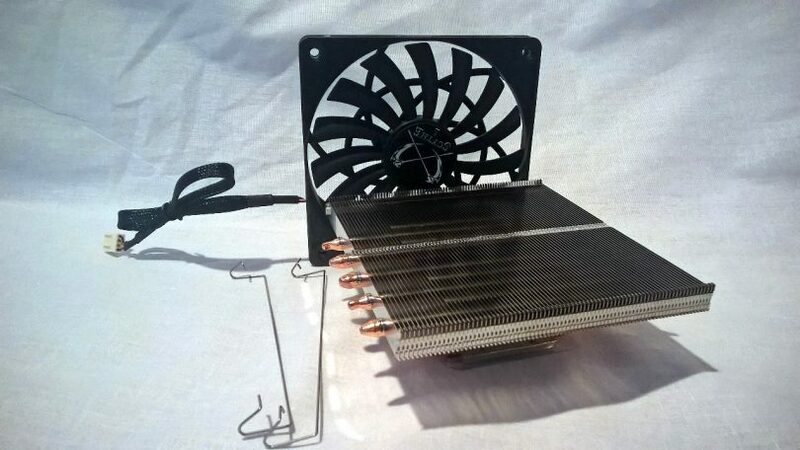 Turning the cooler over once again, and pulling off the fan, we see that the 80 aluminium fins composing the heatsink are pretty densely packed, with each of the heatpipe ends passing through them and poking out of the sides. 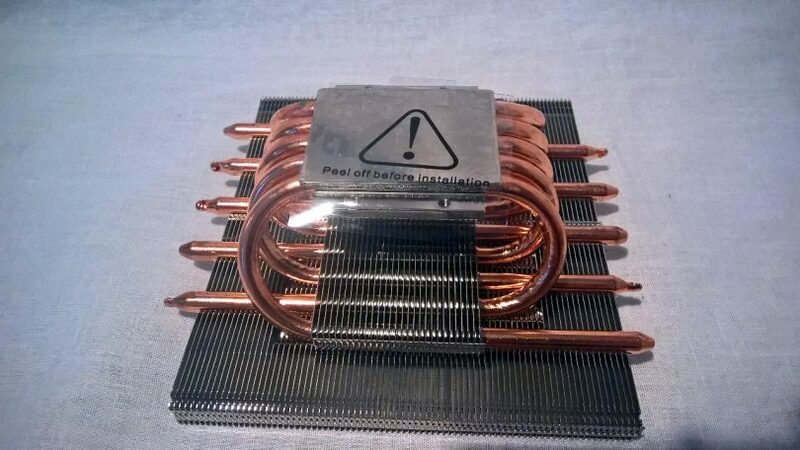 The centre of each heatpipe (five total) passes through the base of the cooler. 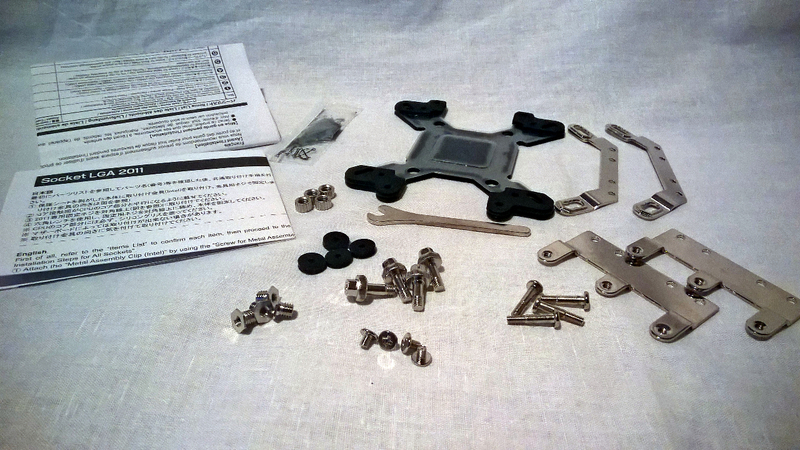 Finally, included in the box is a large selection of parts, including a backplate to mount the cooler. Scythe also includes a single dose of Scythe thermal compound – which I’m not a big fan of, since if you mess up while mounting, or wish to move it to a new system, means that you’ll have to purchase additional paste separately. Either of those scenarios is all but inevitable for most builders. 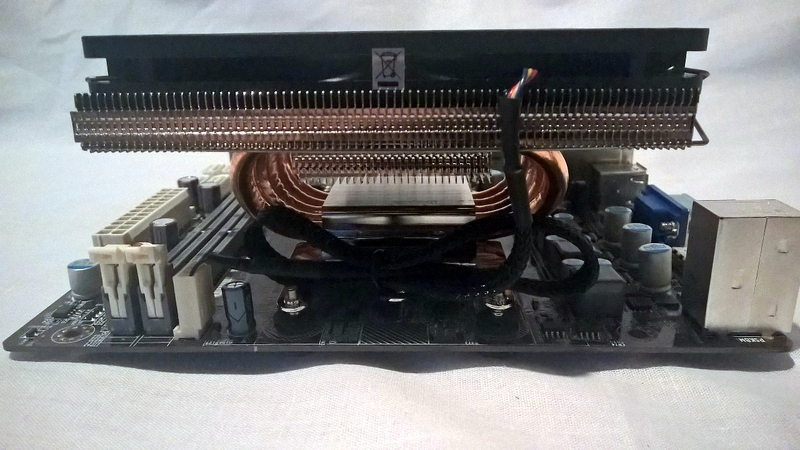 As you can see, even with the 120mm fan, this cooler is still relatively small! Mounted on our test dummy board, you can see the Big Shuriken does limit the height of RAM. That said, standard RAM height (excluding heatspreaders that go beyond the edge of the PCB) will still fit, which is nice. 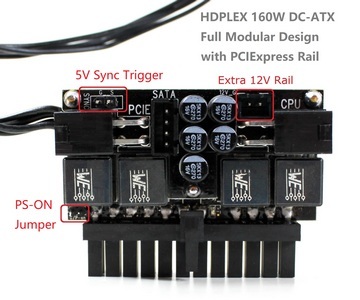 No other components are blocked by the cooler in our own testing, but it has been noted that the PCIe x16 slot may be blocked on some M-ITX boards. As always, you’ll simply have to check to see if this would affect your own build configuration. To test this cooler, we relied on relatively simple testing methodologies. Using Deepcool Z3 thermal paste (a budget, but decent performing, paste), we mounted the Scythe Big Shuriken 2 Rev B to our 89w AMD Phenom. To retrieve idle temps, we booted up Windows, loaded HW Monitor and left the system to idle for 10 minutes. The hottest core was recorded at that time. To load the CPU, we ran Prime95 Blend, with 2 threads (as our CPU is a dual core part). After 20 minutes of load, we once again took the hottest CPU core at that time. Finally, we repeated this test while having the CPU fan plugged directly into 12v, waited 10 minutes under load, and recorded the hottest core. We also measured ambient temperatures and converted all results to Delta T (change from ambient) to normalize the results. 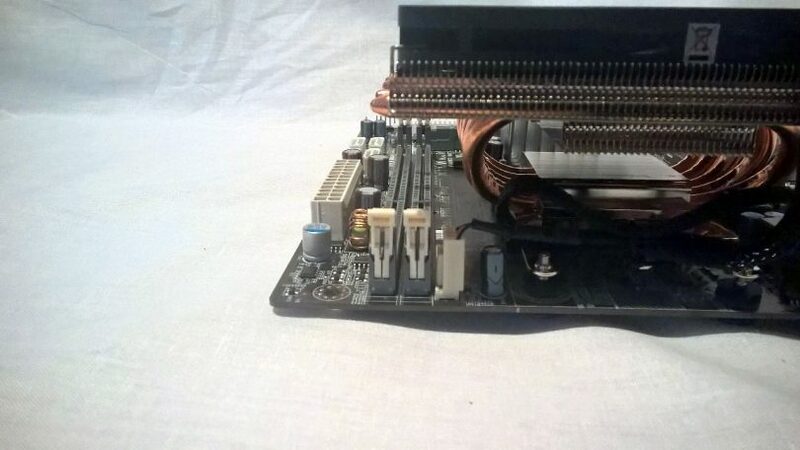 The fans were run at ‘Normal’ fan control mode in our motherboard’s BIOS. Looking at the results, we see that the Big Shuriken 2 Rev B certainly holds its ground with the bigger coolers, as it is only outplayed by the Noctua NH-D15, and the Scythe Ninja 4. That’s not terribly surprising, considering the significant increase in fins, and the mass of both those products. During testing, the fan was quiet, with no notable harshness. A significant upgrade over stock coolers! 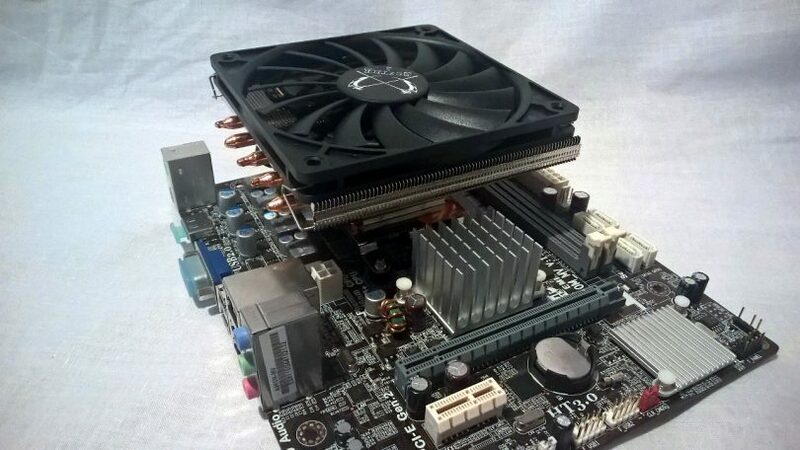 There’s a reason the Big Shuriken 2 and its predecessors have been a stalwart of the SFF world for so long – fantastic performance in a low profile form ain’t easy, but this cooler manages to provide both. 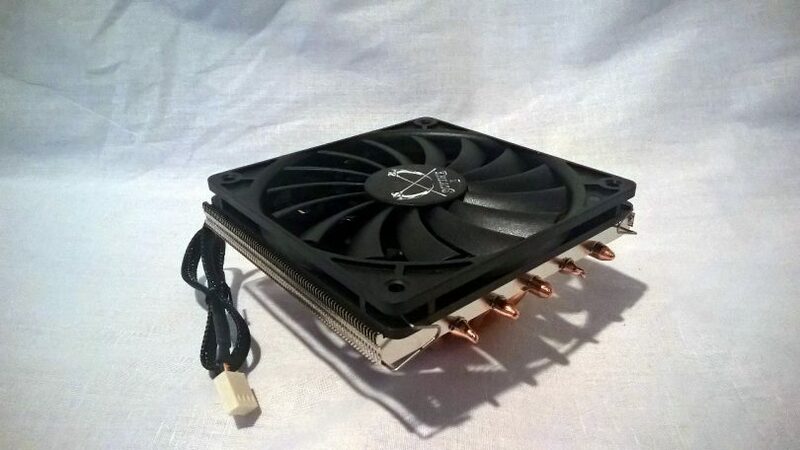 The cooler performs well, supports most modern sockets, and is upgradeable insofar that a standard 120mm fan can be fitted to the cooler (as long as it has open sides). At a price point of $46, that’s a combination that addresses the needs of a large block of SFF enthusiasts, and leaves us wondering what sorts of builds would ever truly need the additional performance provided by larger coolers. Doesn’t block slots or hardware on our test board. The slim fan has been noted in some cases to have an overheating hub. Possible conflicts on some boards, but this is a given with most coolers. This cooler is available for around US$45.99 from Amazon. Review sample provided by eTonix Media PR on behalf of Scythe.